Whew. I’ve been bad about posting again, but in my defense I’ve been crazed for about the past month or so! 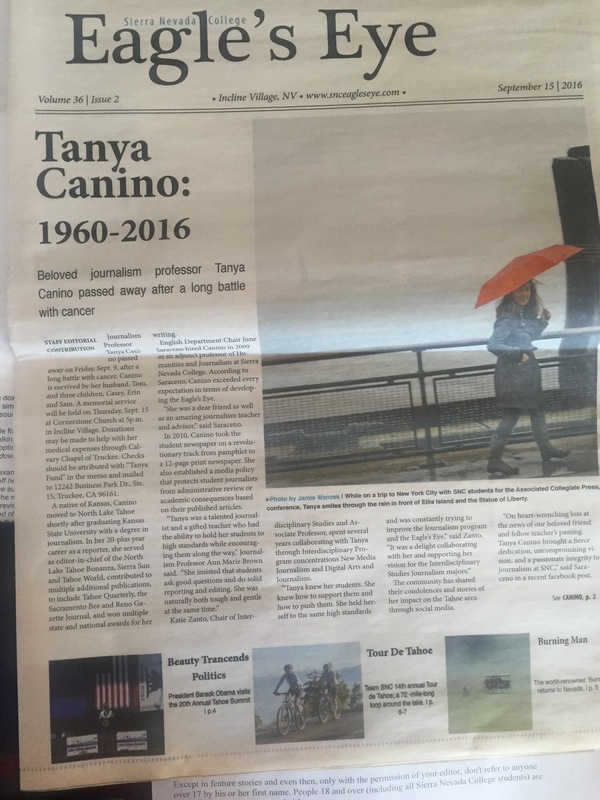 School is going well, but unfortunately a few weeks ago, Tanya Canino, the teacher whom I’d taken over for while she focused on her cancer treatments, died. It was a huge blow to the students, and has been hard on me, too, as she was still helping me out with class information, scheduling, advice. Anyway, it’s been very sad, but we are trying to push on while preserving her memory. On another note, I’m taking four students to a conference in Washington D.C. in about two weeks! We’re attending the National College Media Convention. Should be incredible: Keynote speakers are Edward Snowden, Bob Woodward, Donna Brazile and Jose Antonio Vargas. It will be great, if a little chaotic—students return late on a Sunday night, then have a long Monday putting together the next issue of the paper. And speaking of chaos, I don’t think things will calm down much anytime too soon: I’ve got Home Tours for TQ’s Mountain Home Awards, my write-up for the Winter issue, plus some random travel (besides the conference, the family and I did last weekend in South Lake Tahoe and are going to San Francisco, then Sacramento twice in the next two months), my daughter’s birthday and Halloween (which we are already preparing for in my house). It’s good, but I feel like I’m going to blink and it’ll be Christmas! And on that note, I should get back to preparing tomorrow’s midterm.